Mounting evidence indicates that an untold number of women may be at risk for ovarian cancer due to their use of talcum powder product for genital hygiene. Despite evidence linking talcum powder to ovarian cancer going back to the 1970’s, Johnson Johnson has failed to provide consumers with any warnings about this potential danger, and continues to manufacture and market talcum and baby powder products to unsuspecting women throughout the U.S. In 2013, a South Dakota jury sided with one plaintiff in a talcum powder ovarian cancer lawsuit, and found that her long-term use of a Johnson Johnson talcum product likely contributed to the development of the disease. It is likely that this jury finding will encourage other ovarian cancer victims to file similar claims against Johnson Johnson and other talcum product manufacturers. Alonso Krangle LLP is now investigating talcum powder ovarian cancer lawsuits, and is offering free legal consultations to women, as well as their families, who may have developed ovarian cancer because of talcumum powder or baby powder products. To learn more about your possible legal options, please contact the talcum powder ovarian cancer lawyers at Alonso Krangle LLP today. It is believed that some 40% of women regularly use a talcumum powder or baby powder product, often in the genital area due to its ability to absorb moisture and prevent chafing and rashes. Talcum is a naturally-occurring substance that contains magnesium, silicon and oxygen. Johnson Johnson is the leading manufacturer of talcum powder products, and markets a wide variety of talcum-based baby powders, body powders and genital deodorant sprays. Since the early 1970s, studies have been published pointing to a link between talcum powder and ovarian cancer. Most recently, doctors at Brigham and Womens Hospital concluded that the regular use of talcum powder could increase a woman’s ovarian cancer risk by as much as 24%. Their work, which was published in June 2013 in Cancer Prevention Research, consisted of a meta-analysis of eight different studies that compared more than 8,500 women who used talcum products in the genital area and 9,800 others who did not. According to a report published by the Daily Mail in 2013, some experts believe talcum powder shares chemical similarities with asbestos, a known carcinogen. 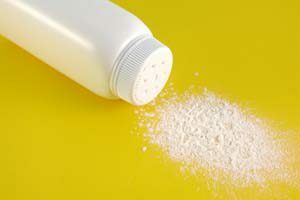 Talcum particles have been shown to travel up through the genital tract and inside the pelvis. Once inside the body, it can take years for talcum particles to dissolve. This can result in inflammation, as well as cancer-causing cell proliferation and DNA damage. In October 2013, a South Dakota jury hearing a talcum powder ovarian cancer lawsuit found that the plaintiff’s use of Johnson Johnson’s “Shower to Shower” product for over 30 years contributed to her diagnosis of ovarian cancer. Though no damages were awarded to the plaintiff, the jury expressed hope that Johnson Johnson would publically acknowledge studies linking talcum products to ovarian cancer, and would add new warnings to its product labels about this potential risk. During the trial in Sioux Falls federal court, three doctors who examined the plaintiff’s ovarian tissue testified that they had found talcum, and blamed the substance for her cancer. One expert witness who had studied the link between talcum and ovarian cancer testified that talcumum and baby powders could be a contributing factor in 10,000 cases of ovarian cancer each year. If you or a woman you love developed ovarian cancer that may be related to the use of talcum products, you may want to consider filing your own talcum powder ovarian cancer lawsuit. To learn more about the legal options available to you, please contact the talcum powder ovarian cancer lawyers at Alonso Krangle LLP by filling out our online form or calling us.